Larparus is a potentially unwanted program that will display a lot of annoying pop-ups. At first, you may not realize that you have this adware application on your computer. Larparus is not too obvious and does not explicitly manifest its presence. Nevertheless, you need to take this application seriously because in the long run it might end up displaying commercial ads with corrupted content. It is necessary to remove Larparus from the system as adware apps might end up being used as gateway to your computer by cybercriminals. You may say that you do not remember installing Larparus onto your computer, and we perfectly understand that it might be the truth. Although this application boasts of an official webpage at larparus.com, the homepage does not have a working direct download link. Clicking the green Start Now button would only open a blank new tab. It clearly shows that the website is put up only for show, and Larparus has other means of distribution. That is why users do not really know when or how they install the likes of Larparus onto their computers. Since there is no direct download link, this application generally travels bundled with freeware. It is not surprising because this is exactly what other applications from the same SuperWeb adware family do – BetterEnhance, Okiitan, TopicTorch and many other extensions employed the same tactics to spread around. Consequently, you have to be attentive when you are about to install a new program onto your computer, especially if this program has been downloaded from a third-party file hosting webpage. If you do not follow the steps carefully, chances are that Larparus will enter your computer. After the installation, Larparus adds extensions to Mozilla Firefox and Internet Explorer web browsers. The main website claims that this application is compatible with Google Chrome as well, but Larparus does not seem to work on the newest versions of this browser. The main security concern related to Larparus is that this application may collect information about what websites you visit and what you search for online. Later on, the information is used to generate commercial advertisements that appear in various types and forms. The content of these ads will be related to your overall web browsing history, thus increasing the possibility of you clicking the ads and landing on affiliate websites. Such behavior is not illegal, but Larparus might be exploited by malevolent third parties for corrupted content promotion. In the worst case scenario you might even get infected with malware. Hence, to avoid serious computer security issues, you should uninstall Larparus right now. If you think that there might be other unwanted programs on your PC, scan the system with SpyHunter free scanner. Finally, invest in a reliable antispyware tool that will protect you from dangerous threats in the future. Select Uninstall a program and remove Larparus. Go to Uninstall a program and remove Larparus. 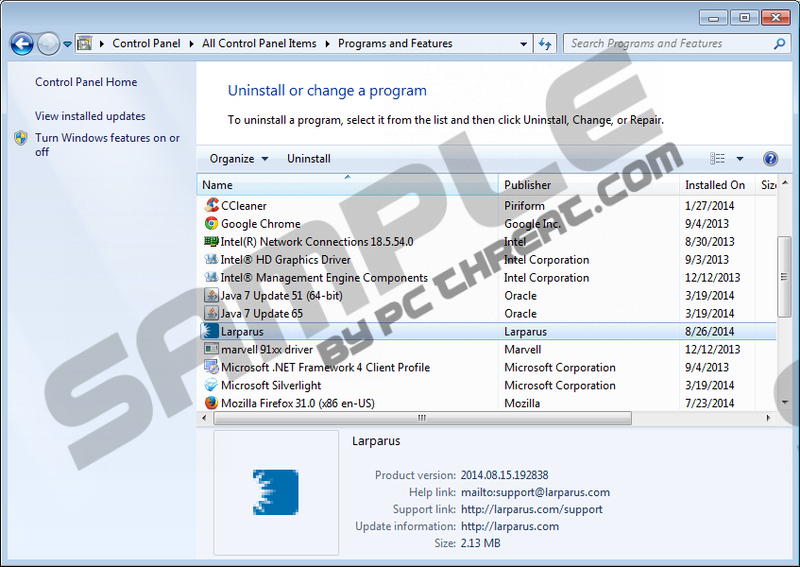 Select Add or remove programs and uninstall Larparus. Quick & tested solution for Larparus removal.